Shenadoah National Park lies along the Blue Ridge Mountains in Virginia. It was established as a National Park in 1935. All summer we had a 9-day hole in our house sitting calendar. Usually, I try to patch up these holes for a seamless, homeless transition from petsit to petsit as we move through Cabbagetown. But this summer I let the gap linger, not even hoping for some weird coincidence or party conversation that could lead to filling it up. One of my Facebook van groups was having a meet up in Ohio and it mostly fell during the end of this break in our schedule. I thought it might be fun to attend and meet some van dweller and enthusiasts in real life who I have only known virtually. 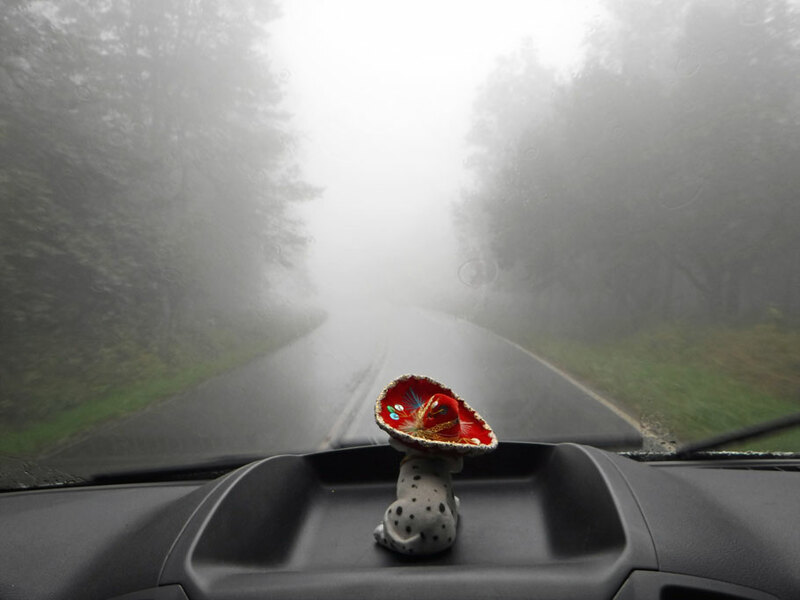 We decided to make a journey of our time off by visiting friends and family along the way to the gathering. At the last minute, our 9 days turned into 10 when some house sitting arrangements changed due to Hurricane Florence. Instead of finding a friend’s house to stay at or a driveway to “moochdock” in we accelerated our schedule cramming two days of stuff into one, told friends we would be seeing them on Monday instead of Tuesday, and hit the road early. First stop was Anderson, SC to see my friend, Denise, who I probably hadn’t seen in 15 years or so. Before we started our first season on the road in Ballena Blanca Denise made a post on Facebook saying that her granddaughter, Natalie, loved getting mail and asking for people to write her letters. We decided to send Natalie postcards from all the places we visited that winter. It was great seeing my long lost friend again, and finally meeting Natalie and delivering to her a present of color-in postcards we bought for her a year and a half ago. We left Anderson for Greenville, SC where we stayed the night at our friends’, David and Michelle. David and Michelle are not long lost – they are some of our besties. We see them at least once a summer and they we among the few friends who had a chance to come and visit us on Blue Wing. From Greenville, SC the plan was to go visit traveling friends, Mary and Preston in Greenville, NC. We met them on the road 2 years ago in Texas while we were traveling in Ballena Blanca. Since then have run into them either on purpose or by accident in 4 more states. We were thinking that we would add a 6th state to our story, but Hurricane Flo wasn’t having any of that. Although Flor had already passed she left behind flood warnings all along the Carolina coast. We decided to give our friends a miss this time and do some sightseeing instead. Shenandoah National Park was on our way to our next friends and family destination, Everett Pa. Since we still have our $80 National Park Pass and always want to squeeze more value out of it we pointed the van towards Virginia. 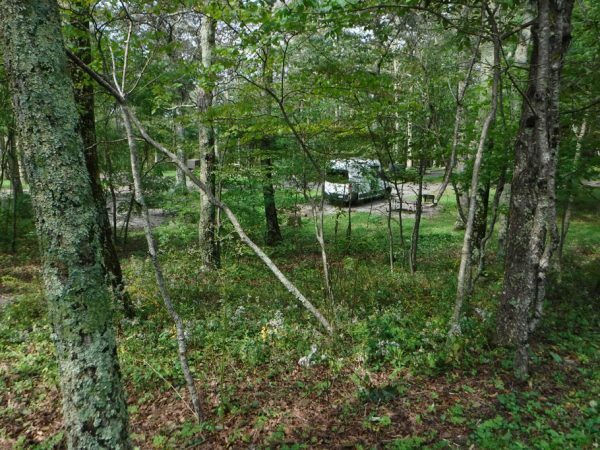 We headed north hugging the western edge of North Carolina crossing the mountains into Tennessee adding an hour to our drive in order to avoid any of Florie’s side effects en route to a National Forest boondocking site we had camped at a few years before in Virginia. But Flossie was testing our patience and decided to throw cold water on those plans too. She left the rivers there running fast, full, and threatening to flood. Upon arrival, we found that the Forest Service had closed our campsite until the danger passed. It was late and we were in the middle of nowhere, so we turned around and drove until we found a cell signal. I searched online for somewhere we could park for the night while Greg steered us back towards the highway. Although it wasn’t the serenity of the woods I was looking forward to, I found the serenity of the familiar in a place we could safely stay the night. After a drive about an hour north, we pulled in and I immediately felt at home when I saw them – our people, the van lifers, the RV crowd – cozy and snug on the asphalt lotdocking at Walmart. Walmart brought less than a 30-minute drive to Shenandoah, so the next morning we hopped up bright and early and headed on to the park. At the entrance station, we learned that Bossy Flossy had made a stop at the park before us driving everyone out and causing it to shut down for a few days. Luckily, for us, they had just reopened the evening before. Ok – you linear types, if you are still with me, it is time to pop out, and look at the pictures and read captions. On to see the fam…. We spent that night in Shenandoah, then the next in the George Washington National Forest before heading on up to Pennsylvania to visit my Aunt Eunice and her family. I am probably one of hundreds of people who call Aunt Eunice “aunt.” It isn’t that she is so extremely beloved or any of that (although she actually is extremely beloved and all of that). It is literally she probably has that many nieces and nephews and great and great-great nieces and nephews. And probably great-great-greats too. But me, I am the only daughter of her only brother and only one of three who call her aunt who might wonder if they might share some of her amazing inherited qualities. We stayed with my cousin Kris in a farmhouse that was once owned by my grandparents. Aunt Eunice just lives a very short hop down the lane, through a patch of woods, and over a hill in a farmhouse surrounded by crop fields and pasture land her and her husband bought and farmed over 60 years ago. Everett is a very small town. Aunt Eunice taught high school gym and health classes in Everett for over 40 years to probably half the population, their children, and maybe even their grandchildren. Seriously, she is beloved and all that. We had a great visit and although Floretta had already left her rivers of rain in PA, the Floris wannabes and posers caught up to us, darkened the skies and made our reunion a bit of a damp one. After two nights we headed out into the rain to Columbus, Ohio – ever so much closer to the van meet up, but before our final rendezvous, we had one more stop – to visit a long long lost boyfriend. It had been probably at least 34 or 35 years since I had seen Mike. I dated Mike back in my punk rock days in St. Louis. Greg has met quite a few old punk rock friends – they are always unique and often intense. Mike is both of these. We arrived as he and his wife, Jamie, were just getting home from a wedding anniversary trip out west. There was lots of unpacking, sorting out of pets and litter boxes, putting everything back in order as well as literal taking care of business. Mike buys and sells things. Some things some people might call junk, some things some people might call treasures. Mike and Jamie’s home is packed full of this junk (I mean treasures) – an ever-changing decor adorning the mantel, the coffee table, the floor. We watched and listened as Mike told us about his business while he packed up a piece of stereo equipment – creating one box out of two and wrapping it with enough black plastic wrap that I’m sure the recipient would have no complaints about the condition that it arrived in but may never be able to figure out how to actually access his purchase. ** Although I make light of Hurrican Florence and we were lucky to avoid any of her consequences, I feel for the people in coastal regions of Virginia, North Carolina, and South Carolina who were not so lucky and are still dealing with the devastation she left behind. The establishment and preservation of the park did not come without controversy or casualties. 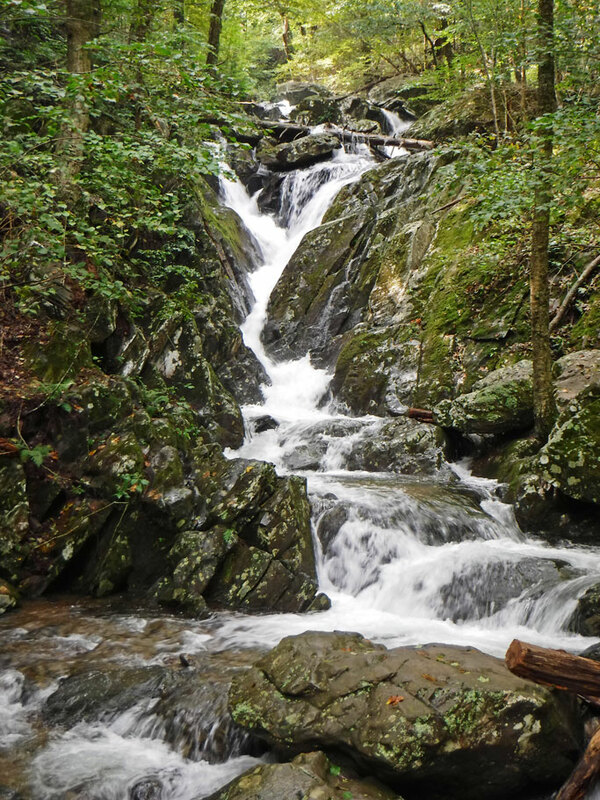 Unlike many of the first parks established in the west which consisted of what was mostly already public land, Shenandoah was mostly privately owned and had to be acquired through eminent domain by the state of Virginia and given to the federal government. At one time over 500 families shared this mountain view of the Shenandoah Valley. The majority of these displaced inhabitants worked the land for a living, selling timber, charcoal or crops. In the early 30s, Virginia was a Jim Crow state. Virginia initially tried to ban African Americans from the park, but the National Parks Service created segregated facilities instead. We camped at the Lewis Meadow Campground which was the designated recreation area for African Americans in the park. Although tales of the amazing food served in the Lewis Mountain dining hall drew white visitors in the late 1940s, segregation in the park did not end until 1950, 14 years before Virginia was forced to desegregate by the 1964 Civil Rights Act. 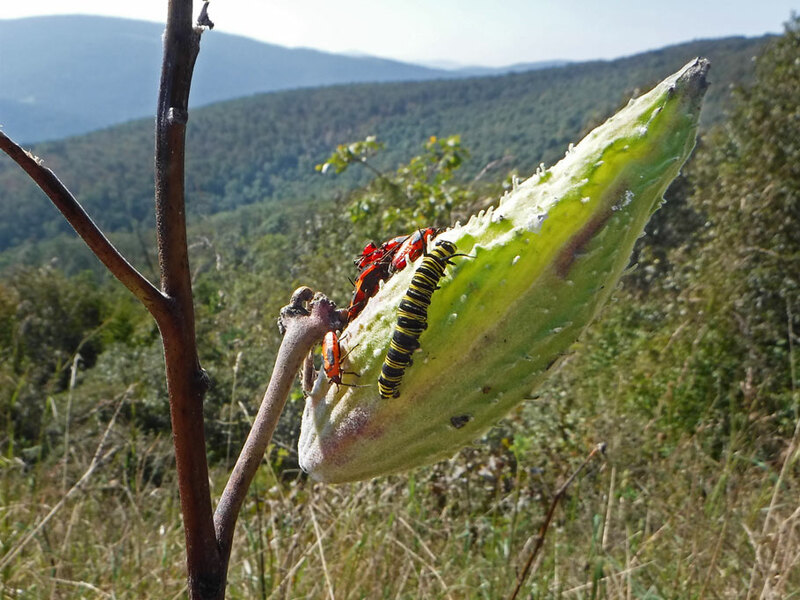 Milkweed pod with Monarch caterpillar and Large Milkweed Bugs. 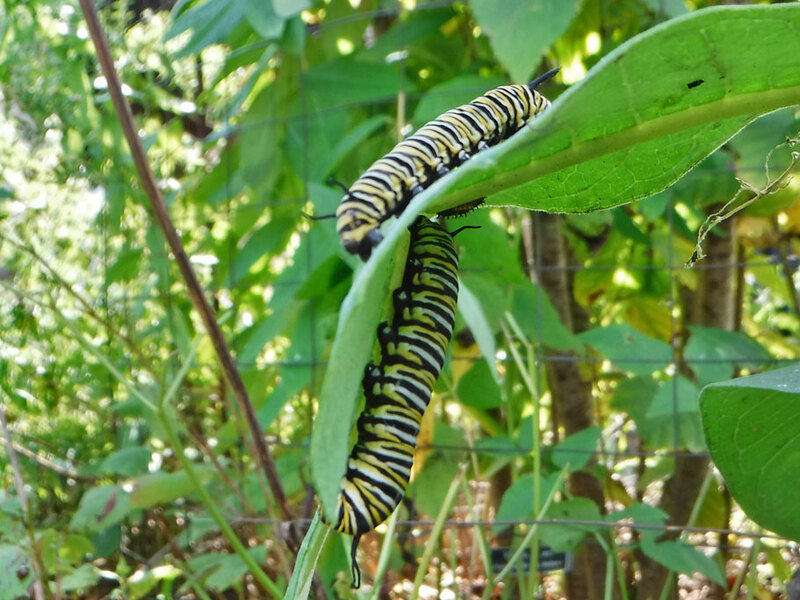 Fourth generation Monarch caterpillars. The first generation’s eggs are laid in the south, as far down as Mexico. 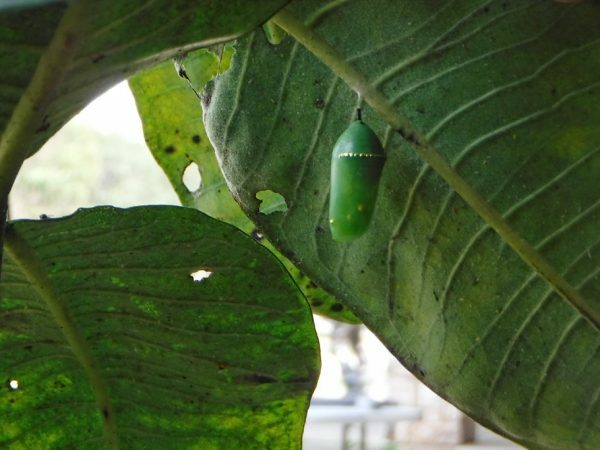 The larva, caterpillar, and chrysalis stages follow. The Monarch butterflies that emerge will travel northward for a few weeks. The second and third generations have the same two month life cycle. The fourth generation butterflies live for months, flying all the way back south. 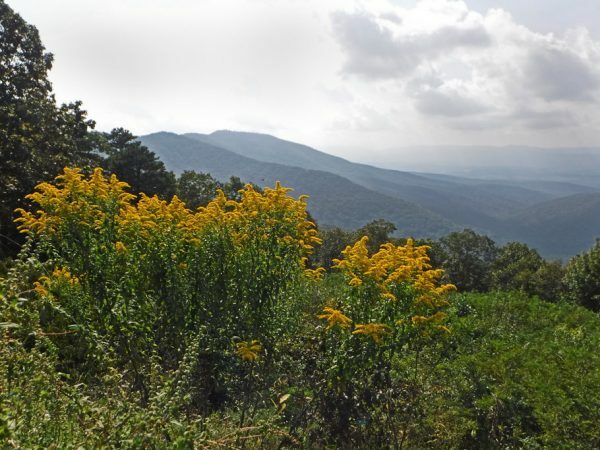 Skyline Drive runs for over 100 miles along the Blue Ridge Mountains. Before we came the rain from Florence caused closures. The park was fully re-opened the day before we arrived. There is still a lot of cloud cover. Here we drive through a cloud. It’s clear a mile ahead. 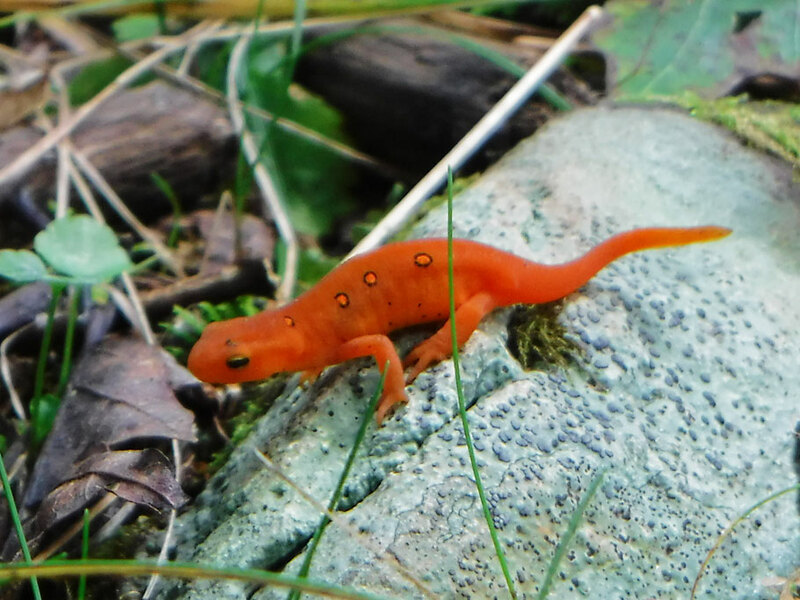 The fog may have obscured some of our views but there was still some pretty things to look at..
Red Spotted Newt we encountered on a walking trail in Shenandoah. 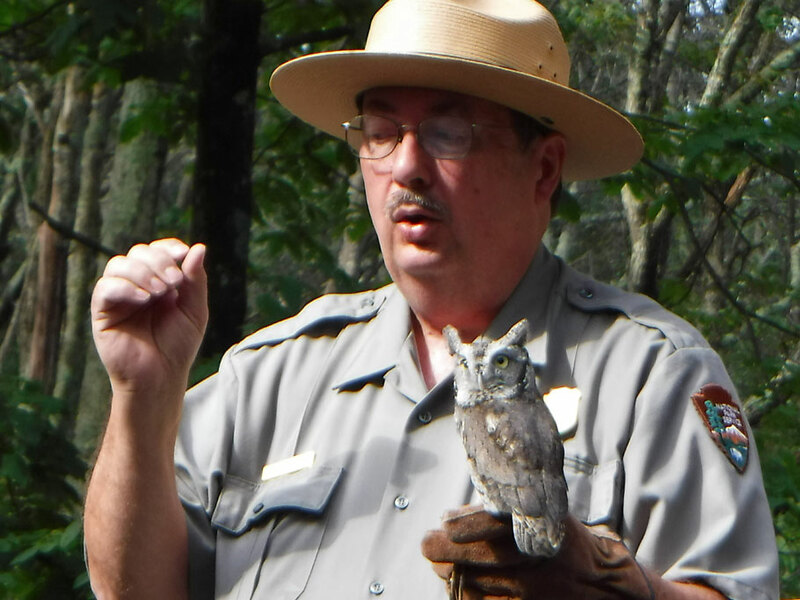 The screech owl perched on this ranger’s hand is full grown. One of his eyes is injured, so he cannot survive in the wild. But he can still turn his head 270 degrees. He has twice as many neck vertebrae as we do. Puddles aren’t just something for us to avoid stepping into. 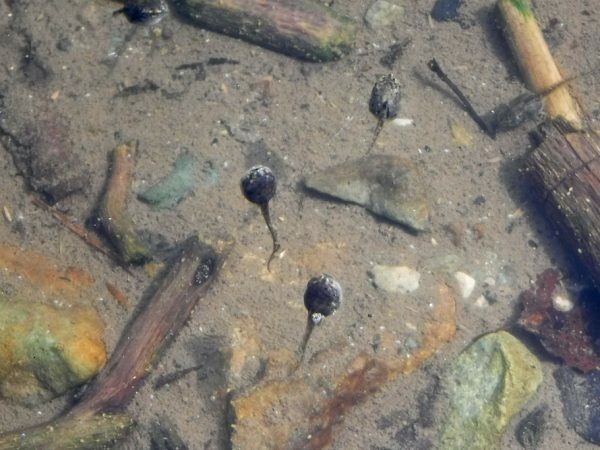 These tadpoles love ’em. View looking west from Hawksbill Peak, the highest point in the park. View looking up from the base of Dark Hollow Falls. This entry was posted in National Park Service, United States, Virginia and tagged caterpillar, lizard, monarch chrysalis, National Park, NPS, screech owl, Shenadoah National Park, Virginia, waterfall. Bookmark the permalink. Great Photos, and stories, too! Your pics of the Shenandoah NP brought back lots of memories! Looking forward to reading about your voyage by van to the wild, wild west! Thank you, Jules! Shenandoah was beautiful, wish we had more time there. We are so looking forward to going west and south. Hope to see you soon! And chestnuts, the people would harvest millions of tasty chestnuts and sell them, and this, too, turned out bad. Love that park, lots of bears. Safe travels. Thanks, Capt. Robert! So great to hear from you all the way from Africa. 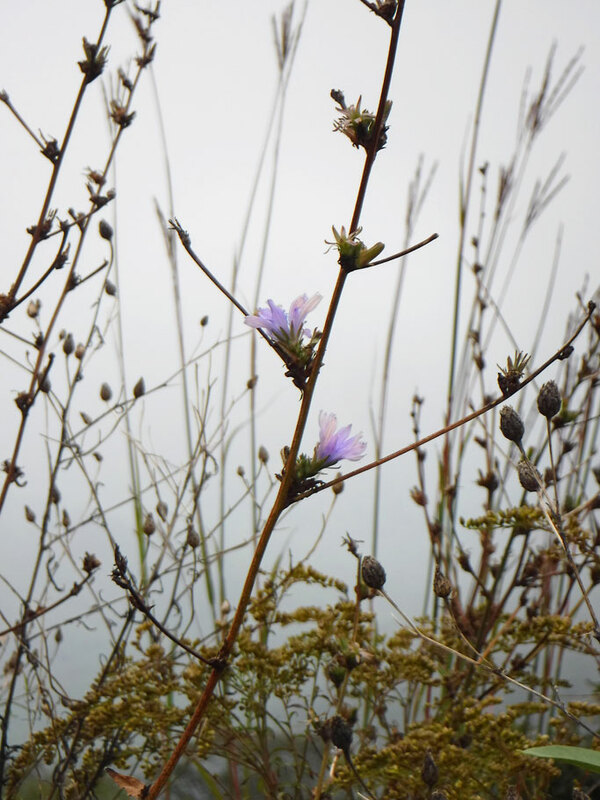 We tried to get a picture of a baby chestnut tree but we weren’t sure how to identify them. They still grow, they just don’t get big enough to produce chestnuts any more. Safe travels to you too! Loved the post card story! Aw, thanks, Jo. We had fun sending the cards! I’m glad you got to use your national park pass again. Isn’t it nice to just hop in and out of these amazing places, showing our “membership” card? 🙂 And, these days, some parks cost $30 a pop for a vehicle (per week), so you only have to visit three parks to get your money back. Not sure what we are up to this year, but it sure has been more than worth it! We never had a national forest close on us because of flood danger, quite the opposite Over the summer, we had to turn around once when a forest was closed due to forest fires and we had to skip a national park for that same reason. I’m happy to read you had such a nice time with friends and family! We recently stayed at a farm in Washington in our van overnight as well. It is owned by someone who has exactly the same camper (a Westy) as us, which was the only connection between us. I love the National Park pass. We debated whether to get one this year but now I think we have ended up going to enough parks to make it worth it. But, of course, even if we hadn’t visited many parks I think it is worth it just to support the NPS. The fires were so awful. Our parks and forests are such precious resources. I have never seen a van like yours on the road. It must be very interesting to meet others who have the same vehicle! So happy to hear from you! Will email soon.